2012 Bowman Baseball has just hit the shelves and this year’s release is looking awesome. 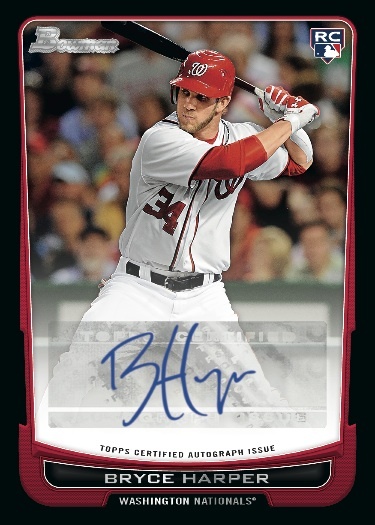 Bowman is loaded with great autographs, sick looking ICE cards and special bonus perks. 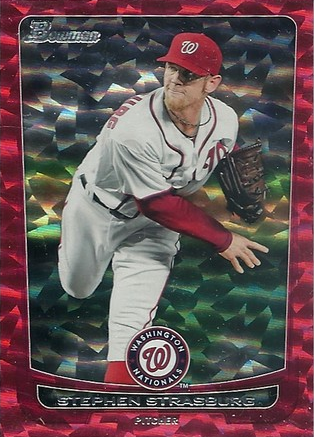 Add to that cards of future stars like Dylan Bundy, Gerrit Cole, Trevor Bauer, Bubba Starling, Danny Hultzen and Anthony Rendon in this year’s release should make it one of the best Bowman sets to collect. So here are some of the things to look for when opening boxes of Bowman Baseball this year. 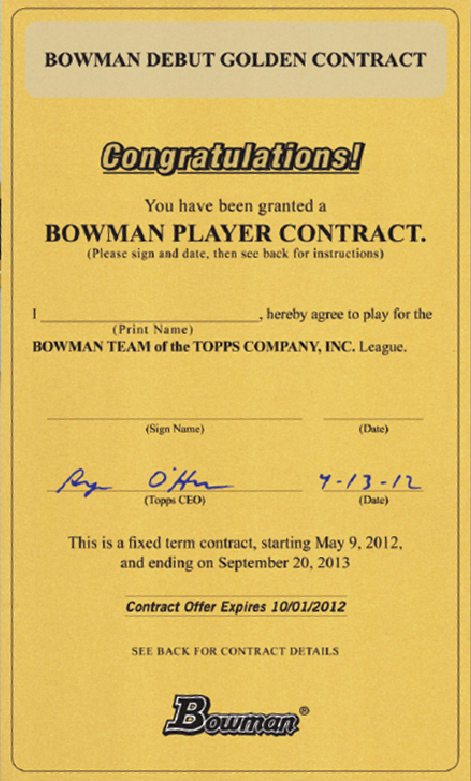 Topps has randomly inserted 10 Bowman Debut Golden Contracts in hobby boxes of 2012 Bowman Baseball. Each Golden contract guarantees you an autographed Yu Darvish baseball. One lucky winner be selected out of the group and will receive their own Bowman Baseball Card in a 2013 Bowman release, a $500 signing bonus and a Bowman jersey. I don’t know about you, but being on a baseball card has long been a dream of mine. This is so cool that someone will wind up with their own card. Collectors who send in 24 hobby or 7 HTA wrappers from 2012 Bowman Baseball will have a chance to receive a free 5-card pack of exclusive Blue Wave Refractor Parallel cards. In addition, bonus autographed cards featuring hot prospects such as Josh Bell, Dante Bichette, Jr., Gerrit Cole, Matt Purke and many more have been randomly inserted into these packs. But you will have to act quickly because there are only 10,000 of these exclusive packs and they will be given out on a first come, first served basis while supplies last. 2012 Bowman Baseball includes an all-new autographed card insert called Bowman Black. This is an extremely exclusive set of autographed cards featuring some of the top players and prospects including Bryce Harper, Gerrit Cole, Dante Bichette, Jr., and Anthony Rendon. Their signatures will be featured on all-black cards complete with an on-card auto in silver ink. Bowman Black will be a continuity program that will feature 25 new autographed subjects (sequentially numbered to 25) in every 2012 Bowman product. When you are ripping packs of 2012 Bowman Baseball you could hit a randomly inserted lucky redemption card. There are 3 different Lucky Redemption Cards in all, each of which will entitle you to one autographed card. Lucky Redemption Card #1 can be exchanged for an autographed Yoenis Cespedes Rookie Card. Lucky Redemption Card #2 can be exchanged for an autographed Bryce Harper Rookie Card. Lucky Redemption #3 has yet to be announced. There are only100 of each Lucky Redemption Card. 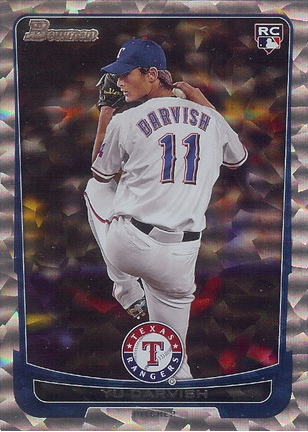 2012 Bowman Baseball is about prospecting, collecting stars of tomorrow early. 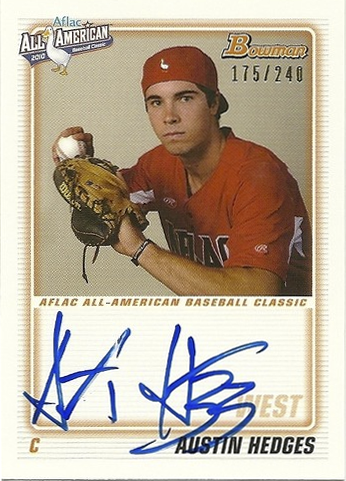 Bowman Baseball will feature autographed AFLAC All American cards randomly inserted into hobby boxes. You will be able to collect the very first autographed cards from 11 promising stars, Sonny Gray, Andrew Susac, Jordan Swaggerty, Dillon Howard, Gerrit Cole, Stetson Allie, Mathew Purke, Dillon Maples, Austin Hedges, Jose Fernandez and Daniel Norris. Bowman Baseball is offering another cool parallel of the base set with Ice Parallels. Silver Ice cards can be found at a rate of 1 in every 24 packs and Red Ice cards are limited to 25. And, of course, 2012 Bowman Baseball offers the cards collectors crave like the various color refractors and superfractors that go for big money in the aftermarket. HTA Jumbo boxes of 2012 Bowman Baseball come with 12 packs per box at 32 cards per pack and feature 3 Autographs per box. Hobby boxes of 2012 Bowman Baseball come with 24 packs at 10 cards per pack and feature 1 Autograph per box. 2012 Bowman Baseball cards are also available in various configurations including single packs and rack packs in retail stores near you.